I came across this image recently during a random search for something else; something entirely unrelated to the subject matter of the photo. But that’s they way the internet is, though. And for a fair while I stopped to consider it. The image, not the internet. Novelist and screenwriter, Richard Matheson passed away on 23 June 2013 at age 87. Somehow I’d missed that announcement. June was rather a hectic month and seems to have flitted past in mere moments. Nevertheless, I was deeply saddened to hear of his passing. To say I was influenced by his works – often without knowing it – from an early age is quite an understatement. Fans of the original Twilight Zone would likely recognise his classic episode Nightmare at 20,ooo Feet, starring a young and much less annoying William Shatner. My first introduction to Matheson’s work, however, was the classic 1957 film The Incredible Shrinking Man which, as a child, I saw on late night television many years later, and then, sometime after that, The Omega Man. These films were based on Matheson’s 1956 novel The Shrinking Man and 1954’s I Am Legend, respectively. Matheson also wrote the screenplay for Steven Spielberg’s 1971 made-for-television film called Duel. Although, if I’m honest, I’d actually only seen Duel ages after Jaws was released and only because many critics of Jaws felt it was simply a remake of Duel. 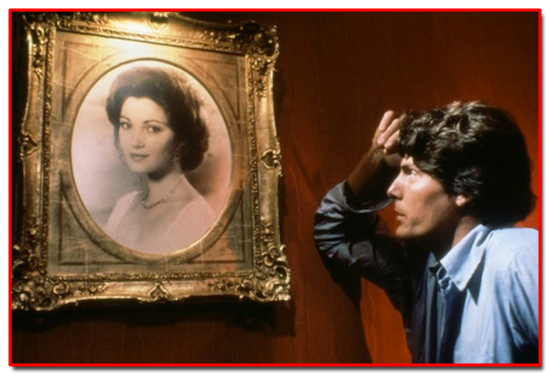 It is also worth noting – as you roll your eyes and sigh – that one of my all-time favourite films, 1987’s Three O’Clock High, was written by Matheson’s son, Richard Christian Matheson, and was the theatrical directorial debut of a Spielberg protégé called Phil Joanou. Anyway, this isn’t meant to be a film history lesson. You’re welcome. But it is meant to be something of a reflection on irony. Matheson wrote a novel in 1975 called Bid Time Return which was, in 1980, adapted for the screen as Somewhere In Time starring Jane Seymour and the late Christopher Reeve. The title of the book is taken from William Shakespeare’s Richard II in case you’re interested, but Somewhere In Time sold more tickets, apparently. The photo up top, naturally, is a still taken from the film. It was, and probably remains to anyone who remembers the film, one of the most iconic images from it, and fairly indicative of the nature of the plot. Suffice it to say, for now, that in both the novel and the film, the protagonist, Richard Collier, becomes obsessed with a nearly century-old photograph of a young actress called Elise McKenna. He finds himself, as the still frame suggests, often staring endlessly at her portrait with a crushing sense of longing to bridge the vast years between them. So part of the irony in all this is, when I stumbled across the image, buried amongst numerous other unrelated bits in a Google search, I was struck by the fact that it seemed the perfect metaphor on the state of my personal life at the moment. And I thought, I know exactly how it feels to stare across that abysm of time at something you will never have. But the irony is two-fold. First, a little over two years ago I posted about rekindling a relationship with someone from my past. History, of course, has quite a nasty way of repeating itself, and though I still see Ina Morata every once in a while, whatever was there finally died sometime last year when, as our relationship strained under the weight of her stoic indifference to and avoidance of my feelings, I finally walked away. She was, and still is, fairly irritated and confused by my choice, unable, it seems, to fully comprehend why I can’t just live forever in the cold, bitter isolation of The Friend Zone and be content with it. Second, both at university and in my rather lacklustre position at Big Box DIY I am surrounded by an overwhelming preponderance of people very nearly half my age. And the greater majority of those people, particularly at Big Box DIY where I live some ±45 hours per week, are, of course, women. And whilst I am notoriously poor at ‘acting my age,’ preferring to live by the adage that You Are Only Young Once But You Can Stay Immature Forever, I occasionally tend to forget there is a considerable gap. As much as it gutted me to walk away from the prison of The Friend Zone with Ina, it has been even worse to find myself working very closely – very nearly every day for over a year – and developing what feels like a very strong connection with an amazing, funny, and beautiful woman – a single mother – quite a bit younger than me. My work wife, Rachel, is constantly reminding me, however, like a little metaphorical cartoon Angel of Conscience on my shoulder, that whatever ridiculous notions of a relationship I could possibly dare to entertain concerning her dear friend, Miranda, have a vanishingly small probability of ever coming to pass, as she doesn’t really know I exist beyond the walls of Big Box DIY and perhaps I simply ought to just consider being gay. But how is it that this lives in thy mind? What seest thou else in the dark backward and abysm of time? Deciding ‘abysm of time’ was the appropriate title for this post and wanting to be sure I cited it correctly (as memory does not always serve as well as it ought to do), I looked it up. Carl Jung would have said it was a perfect moment of synchronicity for me to have been reminded that the quote comes from Shakespeare’s The Tempest, and is a line spoken by Prospero to Miranda. Sigh. Oh well. I suppose it’s nothing a little time travel couldn’t fix.